It is so exciting, as a child, to hear your Father say “I love you”, “You are beautiful”. Imagine how exciting it is for people to hear their Father God say, “I love you”, “I care enough about you and know you so intimately that I have something here that is just what you need to hear.” That is basically what happens when we give people prophetic words. I love being on the prophetic team at church and people come forward for a prophetic word. They get out their phones to record the word and myself or my partner begin to prophesy and tell them what we sense God is saying through us to them. Most times, we don’t get very far in before they start to cry. You see tears form in their eyes and they start to get emotional as what we are saying touches their core. God knows exactly what this person needed to hear and our job was to hear from God and then communicate it to that person. Other times I have written names on sheets of paper of people whom we will be ministering to in a few days time. I have then seen my kids draw pictures on those sheets of paper at home. When we arrive at the ministry session, my kids give those sheets of paper to the people and find that that is exactly what the person needed. Last year I was at a trivia night and three people came up to me. I remembered these three different folk from an AA type meeting we had been invited to six years ago. Hubby and I gave prophetic words to each participant and my kids had drawn pictures for each person. Each of these three people commented how the pictures my kids had given them were still on their fridge and still meant so much to them as they were so accurate. You and your kids can do this as well. 1 Corinthians 14:1 “Follow the way of love and eagerly desire gifts of the Spirit, especially prophecy.” You can desire and develop the ability to hear God’s voice. Practice is crucial to develop skills in just about anything and the same is true with prophecy and hearing God’s voice. The more you practice something, the better you get at doing that activity. There are numerous ways you can practice. Turn it into a game. On my website, I have basic kids games that we have adapted to be prophetic practicing games. Also look at part 1 and part 2 of this series of “Helping my kids to hear from God” for further hints on how to begin, firstly with hearing God for yourself and then for others. My kids have always preferred to draw pictures for people (even though their drawings are quite basic) and I will then ask them what it is they have drawn and write what they say along the top, together with the person’s name it is for plus the date. 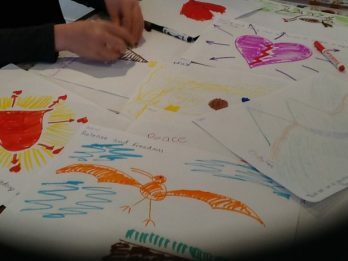 We have taken every opportunity we could to develop this, drawing prophetic pictures for all the students and teachers in a school in Nepal, other times for every participant at a ministry workshop for over 80 people. I believe the key is to practice and keep listening to what God is saying or showing. I often use the phrase “what is God showing, telling or giving you for that person?”. I love prophetic activations for this reason. Prophetic activations are basically some exercises that you can do to help you practice hearing God’s voice and sensing what is on His heart for a particular situation or person. At the end of each of my blogs on this website, “Unlocking the Gold”, I always compose five prophetic activations. They include one aimed specifically at families or groups of children, another one for groups, beginners, someone a bit further down the track and another for people who consider themselves quite advanced and have been operating in the prophetic for a while. You are most welcome to do the whole five each week. The individual activations will take about five to ten minutes to do. Some may take a bit longer eg twenty minutes. I have found with my children that they hear God immediately and they are finished within five minutes whilst I am usually still trying to work out what God is saying. My first year at operating in the prophetic, I used to write 3-5 birthday cards per week. At that time, I was involved in a weekly meal to help people who were struggling with life issues, usually suffering from mental illness as well, and I would write encouragement cards and birthday cards for these folk, as well as cards for friends and family. On the left hand side of the card, I would ask God what to write, listen to what I felt Him saying and then write it down. At the time, I was busy with young kids and would set aside the 30 minutes during the kids swimming lesson to do this, putting myself under pressure to finish them in this time. Every time I went to the shops or had a coffee at a coffee shop, I would make a concerted effort to give the cashier or waitress a prophetic encouraging word. I would usually begin by saying, “I notice that you are (and go on to highlight an encouraging character issue)..” It was during this time that I noticed my gifting developing so much. I believe that it was due to my practicing and developing it. Realise that every time you come across someone who annoys you, it is an opportunity for you to discover the hidden ‘gold’ in that person and reveal it to them. I have found that kids respond better and join in when they see you modelling it. 1. Children / Families Activation: Ask each person to think of an elderly person they know. Ask God what He wants to show, tell or give them to draw and write to that person. Then spend some time drawing a picture for that person that communicates what they felt God saying, showing or giving them for that person. Then find a way this week to deliver it to that person. 2. Group Activation: Ask people to take off their shoes at the door. Gather one of each shoe and go around the room, passing a shoe to a person who has to prophesy over the shoe owner. Once they have prophesied, the owner of the shoe can identify themself. Then pass a shoe to the next person and repeat the process. 3. Beginner Activation: Spend time with God, giving Him your heaviest problem. Ask Him to show you what He wants to give you in return. 4. Intermediate Activation: Ask God to highlight to you someone whose blog or emails you receive. Spend time with God, crafting a prophetic word to send back to them to encourage them. 5. Advanced Activation: Abortion (especially full term) is a topic that is being debated in numerous countries at the moment. Ask God to show you His heart in relation to this and how you can communicate that most effectively and to whom in relation to the policy and decision makers responsible in your country. Prophesy into the situation for babies to be recognised as humans from conception.